If you have any questions about this style prior to coming to the store please Click Here to submit your information and we will get back to you as soon as possible. 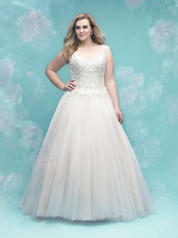 A soft, multilayered A-line skirt is beautiful in motion, especially when topped with a romantic lace bodice. Our customers come from all over New England and beyond to shop our store. 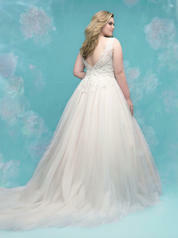 We carry over 10,000 designer, special occasion, bridesmaid and bridal dresses. We have the feeling and savings of a big box store with the customer service of a boutique. We are owner operated and have been in business for over 30 years. All ordered items on our website are subject to availability. Many styles are showcased in our store, but NOT all. Our online store services both domestic and international customers. Party Dress Express takes the security of your information seriously. To prevent unauthorized access, maintain data accuracy, and ensure the appropriate use of your information, Party Dress Express has implemented numerous physical, electronic and administrative procedures to safeguard and secure the information we collect online. However, it is impossible for us to fully guarantee that these measures will prevent any or all unauthorized use of your information. We also do not share, sell or give any third parties any personal or private information except when your credit card is processed.